A light-hearted and sweet romantic comedy that really feels like a smart classic every step of the way. A nice, enjoyable film about a unique situation. Tom Hanks play Sam, a guy whose wife died leaving him alone to raise a young boy. That boy is Jonah; a clever little guy who realizes how unhappy his father is without a woman in his life. That’s when Jonah calls into a radio station and speaks to the do about his father. Suddenly the world wants to know all about this guy, and we follow one of the many women interested. She’s Annie; played by Meg Ryan, and we stay with her as she pursues Sam, despite being engaged to another man. What follows is a pretty fun movie. There’s nothing spectacular or gripping on hand here, but the characters and story feel surprisingly fresh. What romantic comedy waits and waits and waits to have the characters meet, for example? It’s a movie about two different characters in two different worlds that finally figure out a way to come together, with a little help from a kid. This movie is an absolute American classic. Sleepless in Seattle feels like something we’ve seen before. It feels like something so basic and simple, that it’s hard to imagine this is something fresh. Only it is. There hasn’t really been a movie like this, where the two romantic leads don’t know each other until the final moments of the movie. And that’s exactly what the appeal of this film is. It feels like a classic, wholesome film, loaded with humor and enjoyable characters. The premise of the movie is simple enough. A father and his young son are left broken after the boy’s mother passes away. The father wants to move someplace where he isn’t reminded of his wife, everywhere they look, and so he uproots them to Seattle. This part of the movie does happen all the time. A character moves away to start a life somewhere else and to suddenly become a fish out of water to start off the movie. We bought a zoo is a recent example, where the Matt Damon character left his home and moved to a zoo after the death of his wife. But once in Seattle, things take an unusual turn. It all happens one new years eve when the boy, named Jonah, calls a radio station hotline to talk about how his father is so depressed. Jonah tells the radio DJ about how great a guy his father is and about how they moved away and are so unhappy. Then the father, Sam, played by Tom Hanks, gets on the line, and tries to straighten the woman out. Instead, he ends up sitting down and talking to her. Meanwhile, we get transported into another story about a woman named Annie, (meg Ryan), who is engaged to a guy named Walter (bill Pullman), and ready to start the rest of her life. Only for Annie, something just isn’t right. Walter is great, nice, and funny, but there’s just something missing. For one thing, Walter is allergic to everything under the sun and Annie finds this very unattractive. In one funny moment she sits in bed at night staring at him as he breathers through something while sleeping. The night of the radio station phone call; Annie is in the car by herself. I’m not sure that it’s ever explained why she and Walter are taking separate cars to and from her parents house, when they were together right before leaving to go there. Regardless, Annie is in the car driving home when Jonah calls into the radio station, and she gets very interested very quickly. Annie starts shouting things out at the radio, like warning Jonah not to go get his dad and put him on the phone; for fear that he will get into trouble. When Annie stops at a diner to pick up some take out, everyone at the counter is talking about this radio show and Annie gets him or her to turn the volume up. It’s a little ridiculous how much of a sensation this thing is, but we buy into it. Why not? The next day at work, Annie’s best friend, Becky (rosier O’Donnell), is talking all about it too. Apparently everyone was listening at the same time, and is in love with this mysterious man. The movie now becomes about Annie going out to Seattle to pursue this guy. She doesn’t know him at all, and can only tell a tiny bit about him from hearing him on the radio broadcast, yet she’s determined to see who he is and what he’s all about. Only there’s a problem. Sam has been dating a woman who he seems to like a lot. When Annie shows up, Sam has just dropped that woman off at the airport. Annie walks past Sam, getting off her flight and walking into the airport, and Sam turns to watch her. He is instantly hooked. Only she disappears and Sam goes on his way with Jonah. When Annie appears again, in the street, Sam and Jonah have just run into a woman who is an old friend of Sam’s, (Rita Wilson, hanks’ real life wife), and Annie catches a glimpse of Sam hugging her. That’s enough for Annie to turn around and walk off, but not before Sam spots her. He doesn’t get to say anything before she is gone, but now is incredibly curious. He knows she is the woman from the airport, but that’s about it. The movie then goes on to lead us into a third act which is all about them meeting. It’s the climax of the film, with Jonah hopping a plane and sneaking off to New York. What works about it is the way the movie keeps showing us characters watching the film “an affair to remember,” and discussing it in detail. This is the film where two characters met on the top of the empire state building for a romantic encounter. Sleepless in Seattle is using the same idea, and it wants us to know that it’s copying another film. By doing it this way, it is making us realize that it’s a classic idea that has been done before. The funny thing is that when people talk about that kind of moment now, they think of sleepless in Seattle, and not an affair to remember. That’s exactly what sleepless in Seattle was going for. Taking a classic idea and making it feel like they were doing for the first time. This movie isn’t especially creative, other than the phone call situation, but everything that follows it works. Mostly things work because of how simple they are. There are little tiny holes in the story every so often, but none of them really matter (whatever happened to the woman who Sam was dating?) one thing I really like is that this movie was able to have Annie and Walter separate without going the clichéd route of making Walter into a jerk. The Tom Hanks – Meg Ryan follow up to this movie, you’ve got mail, unfortunately fell into that mistake, with both parker Poesy (Hanks’ girlfriend), and Greg Kinnear (Ryan’s girlfriend), showing their true colors as the film went on. 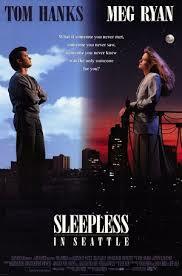 But sleepless in Seattle is a much kinder movie. There are no villains here. Instead it’s just a light-hearted, feel good movie. There are many tricks employed by director Rob Reiner to capture that classic atmosphere, from using old time jazz music as the background track to showing us a few quick scenes of a map of America, either lighting up or having airplane lines move across it. All of this works and adds to the feel of the film. This is a very enjoyable movie.